NERGY SAVING, POWERFUL LEDS: Battery Operated by 2 x AA battery . Use of 2 high-grade AA batteries that will provide 150 hours of continuous ambience. BEST GLOW TIME: Timer feature allows you to set 2H | 4H | 6H | 8H, while you can even time them to automatically turn on or off. The timer will Cycle Every 24 Hours. 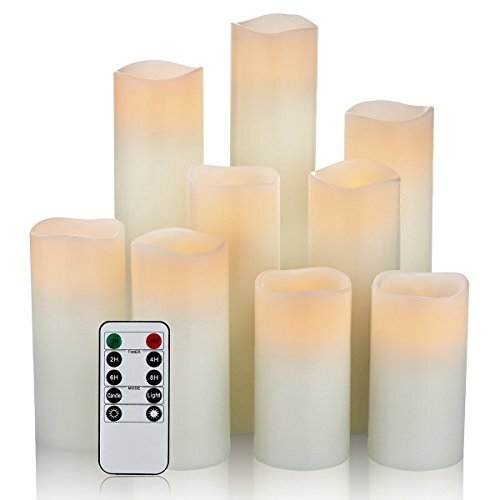 With this super convenient remote you can enjoy the relaxation of your candles without worries. REALISTIC AND SAFE : Incredibly realistic dancing flame without real fire, safe to use around children and pets, never worry about fire-related accidents again. IDEAL DECORATIONS: It can be widely applied to Birthday, Christmas, Home decorations, Bars, Hotel, Parties, Holidays, Wedding, or other holiday decorations. One World Magic Candle Set - Awesome ! Great Item for the home! Beautiful quality candle set! Real vanilla scent! These Are Amazong Battery Operated Scented Candles! I love the smell of these!